Sleat overcame the challenge of the over-35s side Thursday’s Elite to claim victory in the June McCaherty Memorial Sevens. Photo credit: Moreen Pringle. A charity seven-a-side football tournament held in Portree last weekend has raised £2,500 which will go towards benefiting local cancer charities. 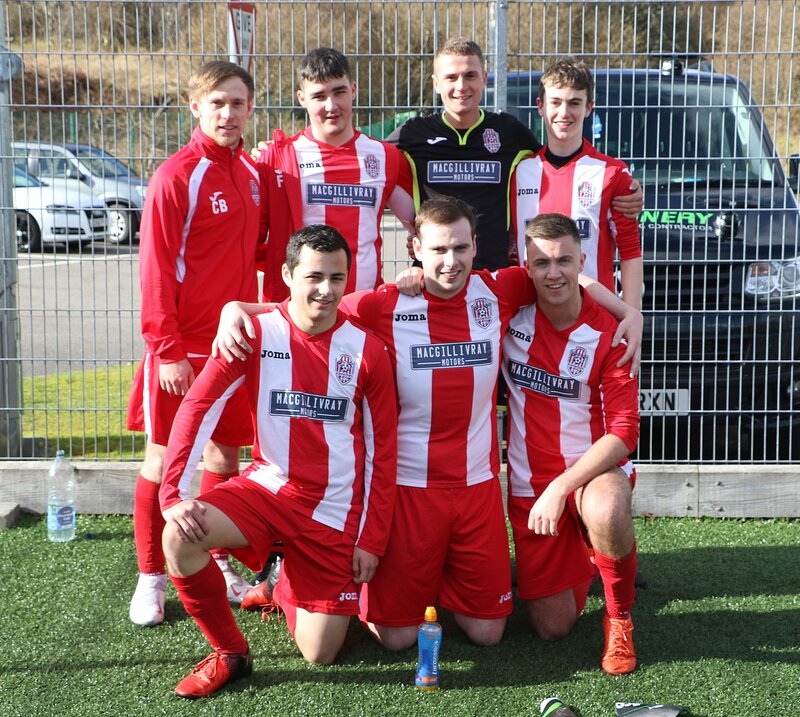 Twelve teams took part last Saturday in the third annual June McCaherty Memorial Shield seven-a-side tournament which took place on the Portree High School pitch. In a final hit by a hail storm, Sleat and Strath’s young bucks overcame the challenge of the tournament’s surprise package Thursday’s Elite to claim a 2-0 victory in the competition and lift the shield. Despite the inclement conditions, it proved to be a well-contested competition played in good spirits. Indeed, a team comprising staff from the Edinbane Lodge and Loch Bay restaurants brought a dash of humour to the day as they shunned conventional strips and instead lined up in their chef ‘whites’. While the culinary concoction fell just short of cooking up a storm on the pitch, chef Calum Montgomery captured the light-hearted mood of the day with a jubilant celebration down the touchline to mark his team’s first goal of the tournament. 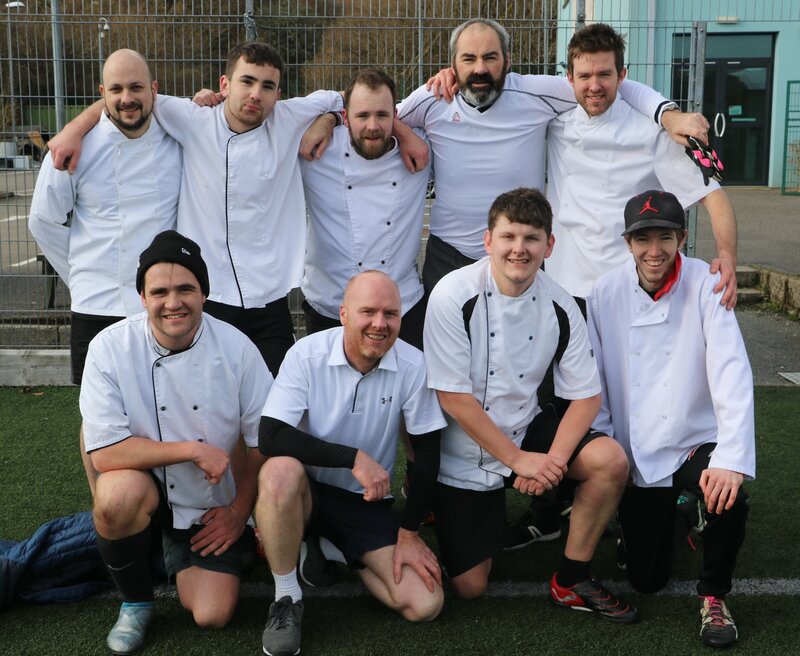 Staff from Skye restaurants Edinbane Lodge and Loch Bay combined to field a team in the tournament. Photo credit: Moreen Pringle. The competition divided the 12 teams participating into two groups of six, with the top two in each progressing to the semi-finals. In Group A, North West Skye Under-18s and a team from Sleat and Strath qualified for the last four from a group including Edinbane/Loch Bay United, a Kyleakin side, and two Portree Juniors sides. 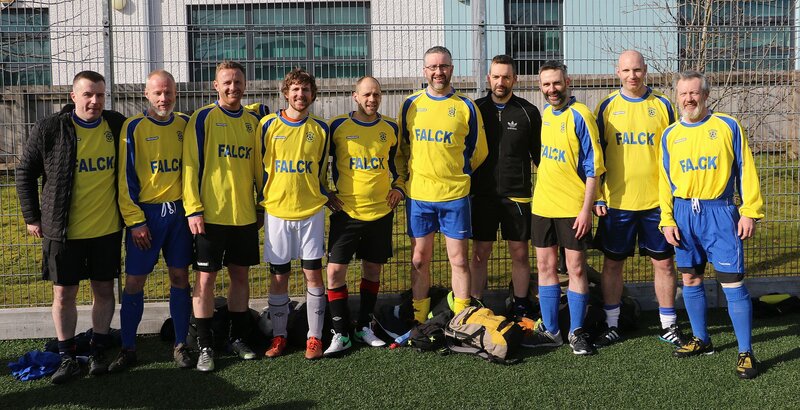 In Group B, Kyleakin progressed along with the over-35s collective Thursday’s Elite who upset the applecart with three wins, one draw, and just one defeat from their five matches. The aged stalwarts ousted North West Skye A, Portree, Portree Juniors (black) and an RK Joinery side to reach the semi-finals from what was a highly-competitive group. Although the weather became progressively worse as the tournament went on, competitors were able to take shelter between matches inside the school where they enjoyed teas, coffees, and cakes generously provided by members of Skye Camanachd Ladies. With nothing to separate Sleat and Kyleakin in the first of the semi-finals, the game went to a penalty shoot-out. In what boiled down to a battle of nerves, Sleat kept their cool to book their place in the final. Thursday’s Elite proved to be the tournament’s surprise package as they upset the odds to finish as the runners-up Photo credit: Moreen Pringle. In the second semi-final, Thursday’s Elite took on North West Skye Under-18s for the right to meet Sleat in the final. Despite going into the competition as one of the outsiders, it was the old boys who prevailed thanks to a superb header from Marco ‘Van’ Broadbent. Displaying style and grace that belied his stature, the powerful midfielder leapt like a salmon at the back post to meet an inch-perfect cross from the right wing and head home a fantastic winning goal to leave North West juniors crestfallen and the Elite ecstatic. The fairy-tale ending was not to be, however, as the final would prove to be a game too far for the veterans. Sleat’s superiority became clear on a snow-covered surface as they dashed the Elite’s hopes of a most unlikely success with a 2-0 victory to claim the shield. The tournament came to a close with the presentation of the trophy by Phil McCaherty to Sleat captain Stuart Matheson and was followed by a charity raffle. Phil McCaherty presents the memorial shield to Sleat’s Stuart Matheson. Photo credit: Adam Gordon. Speaking after the tournament Phil McCaherty told the Free Press: “The tournament was Danny’s idea after June sadly passed following a battle with breast cancer – which will be four years in June. “He thought about a fitting tribute to June’s legacy -as she was always on the sidelines at almost every Juniors match for many years – so the idea of sevens was mooted with the fundraising element as part of the day with each player making a contribution to play.